Fair Winds Press, 9781592337002, 208pp. Finding balance in life is a goal many of us strive to achieve. Whether it's through a healthy diet, exercise regimen, state of mind, relationship, or other activity (or all of the above), we spend our days trying to be, and become, our best selves. But what happens when all that focus starts to dominate our lives? When our desire for "perfect health" trumps everything else, perhaps without us even realizing it? What happens when our solution starts becoming the problem? These are questions that author and popular blogger Jordan Younger faced when she decided that her extreme, plant-based lifestyle just wasn't working in favor of her health anymore--and questions that you may be facing too. 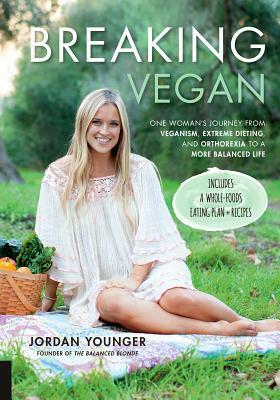 In Breaking Vegan, Jordan reveals how obsessive "healthy" dieting eventually led her to a diagnosis of orthorexia, or a focus on healthy food that involves other emotional factors and ultimately becomes dysfunctional, even dangerous. In candid detail, Jordan shares what it was like to leave veganism, the downfall of her desire to achieve nutritional perfection, and how she ultimately found her way to recovery. In addition to this, Jordan outlines an "anti-diet," whole-foods-based eating plan featuring more than 25 recipes to help inspire others to find similar balance in their own lives. Breaking Vegan is about tolerance and forgiveness. And ultimately, forging one's own path toward happiness. Jordan Younger runs the blog The Balanced Blonde (formerly The Blonde Vegan, or TBV) and is a student at the Institute of Integrative Nutrition, where she is studying to become a health coach. Jordan began her blog in June 2013 to share her healthy vegan recipes and colorful food photos. The blog quickly became popular, but a year later, Jordan found herself struggling with health issues due to her diet and decided to quit veganism. Her blog post "Why I'm Transitioning Away from Veganism..." immediately went viral and landed her a feature on People.com, among others. Today, her blog focuses on balanced eating and living through whole-foods based recipes that celebrate healthy satisfaction over sacrifice. Jordan has been featured in Teen Vogue, Women's Health Magazine, NY Mag, The New York Daily News, The Huffington Post, Harper's Bazaar Australia, Cosmopolitan Australia, Health.com, Elite Daily, People.com, Vogue Turkey, Well + Good NYC, WorldLifestyle, Racked, Fitness Magazine, and more. She has also been featured on ABC News' Good Morning America, Nightline, CBS' The Doctors, Pivot's Take Part Live, HER Radio, Radio MD, Toronto's CBC Radio, NPR. Dr. Steven Bratman began his career as an organic farmer in upstate New York in the late 1970s. After attending medical school, he practiced alternative medicine, including acupuncture, herbal medicine, and dietary therapy. In the late 1990s, he directed a research project evaluating and summarizing all published scientific evidence on alternative medicine methods. He coined the term orthorexia in an article in Yoga Journal in 1997. Dr. Bratman is the author and editor of numerous articles and books, including the Natural Health Bible and Health Food Junkies. Currently, he practices preventive/occupational medicine in the San Francisco Bay Area.